Promotional value expires Jun 11, 2019. Amount paid never expires. This comfortable hotel has won a slew of awards for its exceptional housekeeping and kid-friendly amenities. 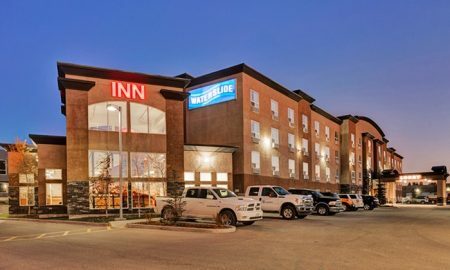 Families can get even more with the included adventure package, which features tickets to a nearby Calgary attraction. Hit the jackpot at the Deerfoot Inn & Casino next door. Start the day right at the complimentary hot breakfast buffet, which features scrambled eggs, breakfast meats, hash browns, and more. 100-foot water slide: Kids will love the indoor pool and its huge water slide; adults may prefer the hot tub. Adventure Package is included in both options: families can enjoy family-friendly add-ons, such as gift packs, popcorn and sodas, and up to two adult and two child tickets to one of the nearby attractions. After oil reserves were discovered in 1947, things around Calgary changed in a hurry. The city’s quaint downtown sprouted skyscrapers, and more than half a million new residents arrived to claim their piece of the pie. You can learn more about C-Town’s recent history at the popular Glenbow Museum or travel back to pre-oil-boom days at the Heritage Park Historical Village. There’s plenty to do in the city of Calgary. Head to Calaway Park, Calgary’s only theme park, and take a ride on The Vortex roller coaster. Brush up on your sports history at Canada’s Sports Hall of Fame, which celebrates Canada’s athletes and other members of the sports community. Thrill seekers should check out Skyline Luge Calgary to pilot a luge down the world’s longest luge track, while science lovers can expand their minds at the Telus Spark science center.